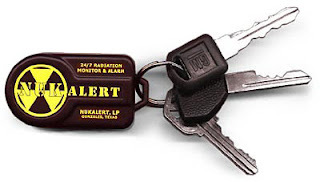 This is a keychain radiation meter and alarm. It is constantly on powered by a battery that from the manufacturer will last for at least 10 years. The device emits chirps depending on the level of radiation in the environment from 100 mR/hr to 5,000 R/hr. The number of chirps the device emits is checked against a table in the back of the device to get the level of radiation in the current area. The table also has the number of hours needed to get to 100R at the current rate. If you take a look at this because it is "cool" think twice because it is quite expensive $160 for one unit, so it is probably a good EDC option only for people that work in environments where radiation is a problem like X-ray exposure, frequent airline travelers, radiation technicians, etc. You can read more and order from the official webpage.